After more than 10 years of planning and work, The Preservation Society of Newport County was joined by nearly 600 supporters for a ribbon-cutting to celebrate the opening of its new Welcome Center at The Breakers on Thursday, June 14, 2018. Four hundred and fifty thousand (450,000) people a year visit the former Vanderbilt mansion, which is now a National Historic Landmark and an icon of America’s Gilded Age. "This is an investment in Newport, in Rhode Island, in our history and in our economy," said Governor Gina Raimondo. "I am proud of you and filled with gratitude for your commitment to Rhode Island, and on behalf of the people of Rhode Island, I thank you." 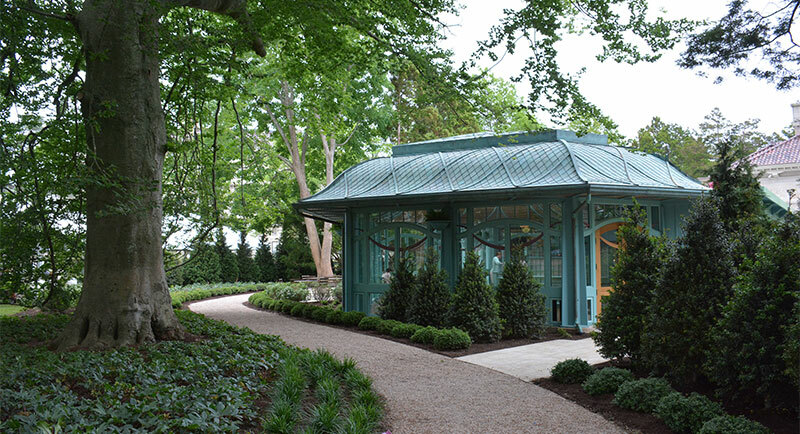 The $5.5 million Welcome Center introduces visitors to the Newport Mansions inside a light-filled, park-like pavilion, inspired by late 19th century garden conservatory architecture, embedded in a newly rehabilitated historic garden. ?The Rhode Island Supreme Court today ordered the City of Newport to "issue victualing licenses...forthwith" to The Preservation Society of Newport County for The Elms Carriage House and the Chinese Tea House at Marble House. "The Court found that only matters of health and safety, as opposed to Zoning considerations, should have been considered when the Council reviewed the Preservation Society’s applications for licenses in 2014," said attorney William R. Landry, who represented the Preservation Society. "The Zoning issues relating to food service were clarified in the Preservation Society’s favor by the Newport Zoning Board in 2015, and in two Decisions by the Rhode Island Supreme Court earlier this year, in connection with The Breakers Welcome Center." "We are grateful to the court for its careful consideration of the victualing license matter, and we welcome today's decision," said Preservation Society Board Chair Monty Burnham. "The Preservation Society is currently focused on beginning construction of The Breakers Welcome Center in the next few weeks, and will announce its plans for The Elms and Marble House in the near future," said Trudy Coxe, CEO & Executive Director of the Preservation Society. The Preservation Society of Newport County welcomes today's decision by the Rhode Island Supreme Court to let stand Judge Stone's ruling that no further review is needed of the Newport Zoning Board’s approval of The Breakers welcome center. "This is exceptionally good news for the more than 450,000 people who visit The Breakers each year from around the world," said Preservation Society Chairman Monty Burnham. "Having modern hospitality for visitors to this National Historic Landmark is vital. It’s time now to set aside the differences over this project and move on to strengthen Newport's future." "The Preservation Society thanks the thousands of people who have supported this effort," said CEO and Executive Director Trudy Coxe. “We especially congratulate the Newport Zoning Board for its careful consideration of this project. A Special Use Permit is only approved on the merits of each individual proposal. We have always believed in the unique merits of The Breakers welcome center." The Zoning Board's 30-page decision followed approval of the welcome center by the state preservation officer and the Rhode Island Historic Preservation and Heritage Commission. The Newport Planning Board also found the proposal consistent with the Newport Comprehensive Plan. Read the Supreme Court decision. (December 7, 2015) The Newport Superior Court today dismissed all appeals of the Newport Zoning Board decision approving construction of the proposed welcome center at The Breakers. Judge Walter Stone decided that none of the appellants had legal standing to challenge the approvals. "This is a tremendous victory for the Preservation Society and for the hundreds of thousands of visitors to The Breakers each year," said Donald O. Ross, Chairman of the Board of The Preservation Society of Newport County. In February, 2015, the Newport Zoning Board voted 4-1 to grant a special use permit for the welcome center, concluding that it would serve the public interest, met all criteria specified in the zoning ordinance, and was consistent with the city's comprehensive plan. This is the second time a Newport Superior Court judge has rejected the Bellevue-Ochre Point Neighborhood Association (BOPNA)'s challenge to the welcome center. Judge Benjamin Gallo last year similarly dismissed BOPNA's appeal of an earlier zoning decision relating to other aspects of the project. Preservation Society attorney William Landry said "There is no automatic right of appeal from today's decision by Judge Stone. The Rhode Island Supreme Court would have to grant extraordinary special permission for the case to proceed further." Added Ross, "This has been a thorough public process, and we're pleased that it's finally coming to a close." (September 8, 2015) The Preservation Society of Newport County announced today that it has received notice from the Trustees of The Helen D. Buchanan Trust of their intent to make a $1.5 million contribution for The Breakers Welcome Center from the Estate of Helen D. Buchanan. It is the largest one-time cash donation in the history of the Preservation Society. "Mrs. Buchanan was an enthusiastic supporter of the Preservation Society for over 15 years, making significant financial donations to projects such as the restoration of the sunken garden at The Elms. This contribution, her largest, ensures that her community spirit and philanthropic vision will live on for generations," said Preservation Society Board Chairman Donald O. Ross. Fanchon "Monty" Burnham, Helen's daughter and a trustee of the Preservation Society for many years, worked with the Trustees of the Helen D. Buchanan Trust to make this contribution. "I am devoted to the Preservation Society and to the state of Rhode Island," said Mrs. Burnham. "As a native Rhode Islander, I recognize the value of tourism for our continued economic vitality, and I know that the Preservation Society is a great economic driver for our state. That's why we need the Welcome Center, to ensure that the Preservation Society's visitors receive the first-class treatment that they deserve." "I cannot find the words to express my appreciation to the Trustees of The Helen D. Buchanan Trust for this contribution, which will ensure a comfortable welcome to the hundreds of thousands of museum guests who visit The Breakers every year. Their generosity and leadership are inspirational to all of us here at the Preservation Society," said CEO & Executive Director Trudy Coxe. In 2013, the Preservation Society announced plans to build a welcome center at The Breakers (1895) commensurate with the property’s stature as an internationally recognized historic house museum and one of the five most visited historic houses in America. The welcome center will create an appropriate, positive first experience for the more than 400,000 people who visit The Breakers from around the world annually, giving them a place to learn about the Preservation Society's properties and other attractions in Newport, plan their day's activities, and purchase tickets or memberships. Visitors will also be able to enjoy light refreshments and use clean and accessible restrooms. The project has undergone extensive public review, and has received all of the necessary state and local permits and approvals. With this latest contribution, the Preservation Society has raised $5.3 million toward its goal of $5.9 million for the Welcome Center. On May 14, 2015, the Newport Daily News published a Guest View column from Preservation Society Board Chairman Donald O. Ross. Read it here. On January 5, 2015, the Newport Zoning Board voted 4-1 to approve a special use permit to allow construction of a new welcome center at The Breakers. Read about the decision in the Newport Daily News. J. Paul Loether, Chief, National Register of Historic Places and National Historic Landmarks, wrote on Wednesday, September 3, 2014, "the implementation of the current proposal of the Preservation Society of Newport County to construct a new visitors center within the boundaries of The Breakers NHL does not require approval by the National Park Service (NPS)." Click here to read the correspondence. The National Park Service (NPS) is interested in capturing much more information about The Breakers caretaker's cottage, the underground boiler room, and the property's landscape features to further enhance the designation of The Breakers as a National Historic Landmark, a move that is actively supported by the Preservation Society. J. Paul Loether, Chief, National Register of Historic Places and National Historic Landmarks, wrote to the Preservation Society on September 3, 2014 that "The effort by the NPS to initiate the process of updating the historic documentation for The Breakers as a whole is focused solely on ensuring that said documentation is as thorough, accurate, and current as possible." Updating a designation can take as long as 1.5 to 2 years. At this point, there is no timetable for revising the designation. Let’s work together with the Zoning Board to craft a permit that preserves both the character of our community and the success of our businesses and institutions. We share the Association’s commitment to protecting Newport’s unique residential areas, where for decades the historic house museums we operate have welcomed visitors in harmony with private homes and quiet neighborhoods. It’s taken a delicate balance to make it all work, and the presence of these magnificent homes and gardens has helped sustain Newport’s attractiveness as not only a great place to live, but also a vibrant international destination. The special use permit we seek creates the opportunity to assure that Newport’s balance of community and commercial concerns is sustained. We respect the need to define the limits and standards of food service within residential districts, and together we can make sure that museum visitor conveniences never threaten the success of restaurants operating in our city’s commercial districts. We are not proposing a restaurant. We are proposing light refreshments--a basic, expected visitor amenity in museums around the world. We’ve offered limited fare for many years at The Elms and Marble House with zero negative impact on our neighbors. But we respect the special sensitivities of our museum locations within residential areas. That’s why, for example, The Breakers welcome center as we propose it will have no kitchen, no dishwasher, no microwave oven. Only sandwiches and salads prepared offsite by local caterers will be provided. And we believe even this minimal level of food service should be restricted to sites with annual admissions of at least 100,000. As we have offered in the past, we remain open to BOPNA’s suggestions. Getting the details right together, we can assure that the delicate balance that makes Newport special for residents and visitors is preserved. So let’s use the special use permitting process to come together on common ground. That’s the future we’re all hoping for. Note: This letter was published in the Newport Daily News and Newport This Week on Thursday, August 14, 2014. You can see the letter as published here. (August 6, 2014) For the second time in less than a month, a Superior Court judge today has sided with The Preservation Society of Newport County, dismissing an appeal brought by the Bellevue-Ochre Point Neighborhood Association seeking to block construction of a welcome center at The Breakers. The court ruled that the Association lacks legal standing to appeal a Zoning Board decision. "We're delighted that the court has once again ruled in our favor," said Donald O. Ross, Chairman of the Preservation Society's Board of Trustees. "We believe that our proposal for a small, elegant welcome center at The Breakers is architecturally appropriate. Providing amenities like restrooms and simple refreshment services at a site with 400,000 annual visitors is a matter of basic customer service and human courtesy. We believe it is time for this small group of opponents to put an end to unwarranted court challenges which are wasting valuable time and resources." BOPNA had sought to appeal the Zoning Board of Appeals decision which granted the Preservation Society a Certificate of Appropriateness for the welcome center. It was the second legal victory for the Preservation Society. Last month, the court dismissed a separate lawsuit brought by BOPNA which sought to bypass Newport zoning officials and declare The Breakers a "non-conforming use" in order to prevent construction of the welcome center. Judge Bennett Gallo upheld the authority of the Newport Zoning Officer and the Zoning Board to rule on the project. Read the court's decision on the lawsuit here. (March 10, 2014) The Newport Zoning Board of Review issued its written decision upholding the Preservation Society's appeal and reversing the Historic District Commission's denial of a Certificate of Appropriateness for the welcome center. Click here to read the decision. (October 2, 2013) In a letter dated October 2, 2013, the RI Historical Preservation and Heritage Commission has affirmed its July vote approving the Preservation Society’s plan for a new welcome center at The Breakers. In direct contradiction of an opinion by Newport Historic District Commission staff, the RIHPHC states that the plan is in compliance with the Secretary of the Interior’s Standards and National Park Service Guidelines, and will not alter the historic character of The Breakers. Read the RIHPHC decision. Read statements of support from the Newport community, preservationists, museum, tourism and business leaders. The Preservation Society of Newport County is proud to announce plans for a welcome center at The Breakers commensurate with the property’s stature as an internationally recognized historic house museum and one of the five most visited historic houses in America. After a decade of work, the Preservation Society's Board of Trustees has selected a design by the architectural firm Epstein Joslin that meets sound historic preservation criteria while providing for the comfort and orientation needs of the hundreds of thousands of people who visit The Breakers from around the world annually. Having already been visited by 20 million guests, The Breakers is now a destination itself within Newport, Rhode Island and New England. Recovery of the original character of the landscape at the entrance of The Breakers is a major feature of the project. The landscape design firm of Reed Hilderbrand has been commissioned to develop a plan to assess and protect the historic character of the site, including the preservation of historically significant specimen trees and plant and a rehabilitation of the perimeter landscape and historic path. Temporary structures added over the last 30 years will be removed, including an amusement park-style ticket booth, a portable restroom trailer, a vending machine shed, and a seasonal ticket tent. 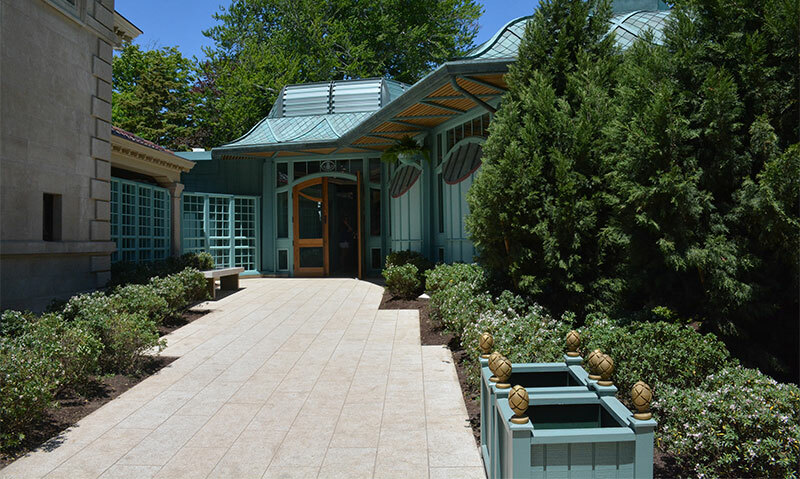 The welcome center’s one-story design adopts the curving motif of the original landscape, incorporating garden architecture inspired by the period, employing energy-efficient and environmentally friendly concepts and materials. Adjacent to the existing service structure from the 1895 Richard Morris Hunt building campaign and embedded along a wooded pathway, the welcome center is situated to provide immediate access for visitors of all ages and abilities, including fully ADA-compliant facilities not always available at historic sites. Occupying a modest 3,650 square feet, the welcome center will offer visitors information about The Breakers, other properties of the Preservation Society and the city of Newport itself, along with refreshments and comfortable restrooms. Construction techniques have been selected to ensure no irreversible alteration to the landscape occurs, no historic fabric is lost and the historic viewsheds – both inside and outside the grounds – are preserved. Also protected from any permanent alteration is the property’s unique historic underground boiler room and coal bunker complex. The welcome center’s colors and materials have been selected to work with the design and siting to screen the structure from The Breakers itself and from Ochre Point Avenue.